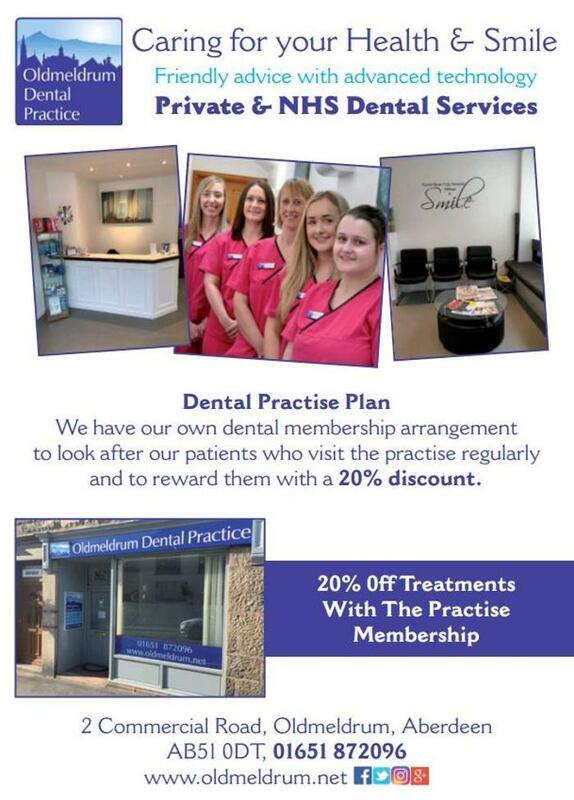 Oldmeldrum Dental Practice was established in 1992 and was extended by Mr A. Wilson in 2001 to include 3 surgeries. 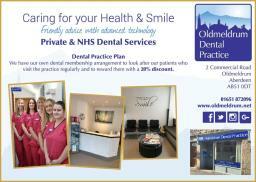 It is now owned jointly by Mr Tony Wilson and his first trainee dentist Mr Douglas Forrest and has 2 part time dentists Mrs Alison Grant and Mr David. 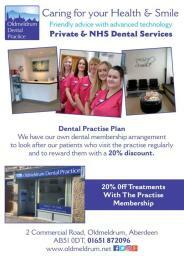 Our two hygienists are Miss Suzanne Thomson and Mrs Joyce Buchan. Our dental team is completed by our Practice Manager Mrs Alison Dalgarno, Head Dental Nurse Mrs Leigh-Anne Wood, Head Decontamination Nurse Miss Elaine Laidlaw and our Dental nurses Zoe Donald and Fiona Robertson. The reception and office is administered Mrs Eileen Oliver and Mrs Leigh-Anne Wood. Oldmeldrum Dental Practice continues to provide high quality private and NHS dental care to the local communities of Oldmeldrum, Pitmedden, Udny, Tarves, Methlick, Fyvie, Rothienorman, Meikle Wartle.